Raise your hand if you put off meal prepping for the week until Sunday afternoon. If you’re following a healthy meal plan, let’s be honest: Figuring out healthy lunch recipes to pack every single day can sometimes feel like a chore. Good news: You’re not alone. Even better news: This roundup of 15 healthy lunch recipes will jazz up your lunch hour and take the struggle out of your weekly meal prep. These easy, super portable meals — think no-fuss Mason jar salads, savory lettuce wraps, and satisfying soups — will cut down on the time you spend in the kitchen this week. Pro tip: Several of these recipes have common ingredients, which can make your meal prep even easier. Have a big container of cherry tomatoes? Make the Vegan Buddha Bowl with Spring Vegetables and the Southwest Chicken and Black Bean Salad. Just picked up a juicy rotisserie chicken? Put the Chicken and Black Bean Burrito Bowl and Teriyaki Chicken Stir-Fry on this week’s meal plan calendar. Read on for more delicious, healthy lunch recipes that are perfect for meal prep! 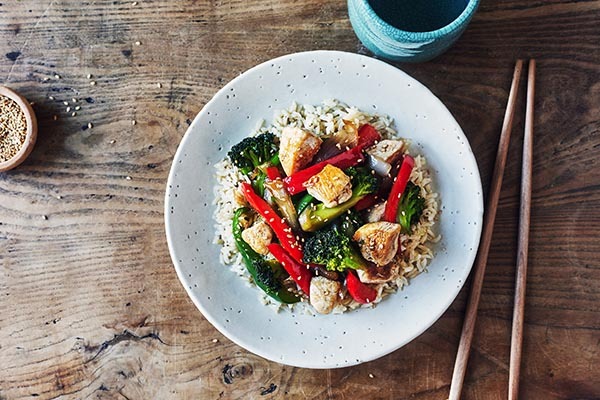 Teriyaki Chicken Stir-Fry is made with chicken breast, colorful veggies, and an umami-rich teriyaki sauce. It’s even faster to make if you have pre-chopped vegetables ready to go. Get the recipe. 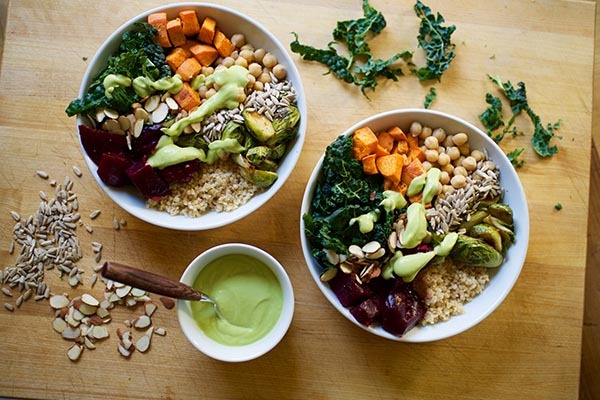 Meal prepped grains, cooked sweet potatoes, and a host of winter veggies give this savory vegetarian Winter Superfoods Bowl protein, fiber, and flavor. With a few ingredients prepped ahead of time, like a baked sweet potato or a big batch of grains prepped for the week, this lunch comes together in a few minutes. Get the recipe. 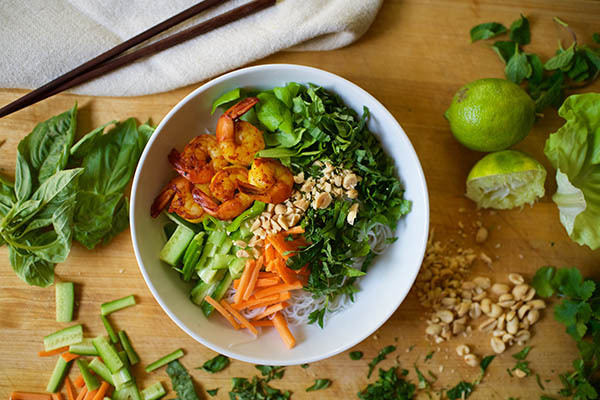 Skip that sodium-laden takeout and enjoy this fresh, homemade Shrimp Noodle Bowl made with pre-chopped veggies, savory herbs and spices, and tender rice noodles. Bean sprouts, cucumber, carrot, lettuce, cilantro, mint, and basil make for a flavor explosion. The finishing touch? A tangy broth and crushed peanuts. Get the recipe. 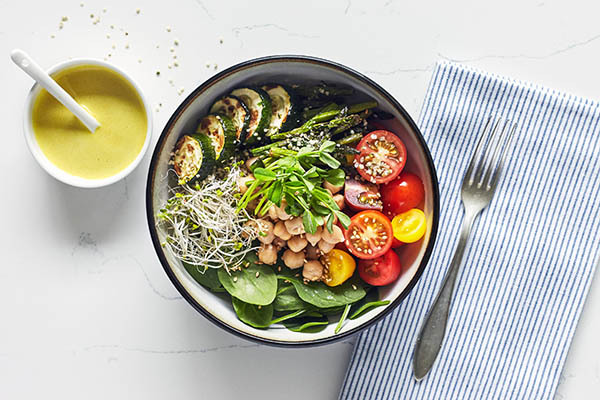 Chop and dice your veggies during meal prep and whip up this Vegan Buddha Bowl with Spring Vegetables in a snap. This recipe comes together a lot faster than you might expect. Multi-tasking is your best friend: As the oven heats, prep the tahini sauce. Then, pop your veggies into the oven until they’re roasted and tender. To streamline the process even further, pre-cook the rice or quinoa. Get the recipe. 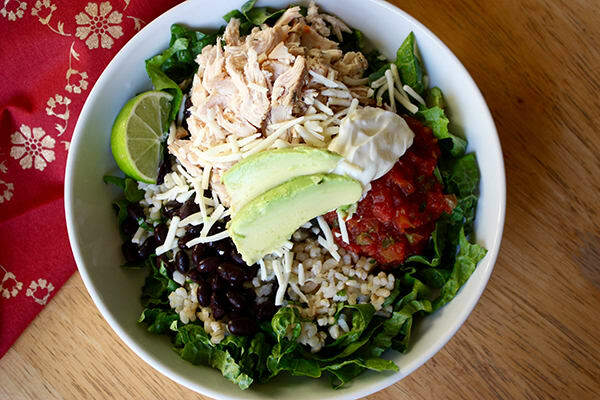 Ditch those heavy burritos and make this colorful Chicken and Black Bean Burrito Bowl for lunch, made with avocado, tender pulled chicken, and hearty rice and beans. And with fresh salsa, a squeeze of lime, and creamy Greek yogurt on top of crisp romaine lettuce, you don’t need any kind of dressing! Get the recipe. 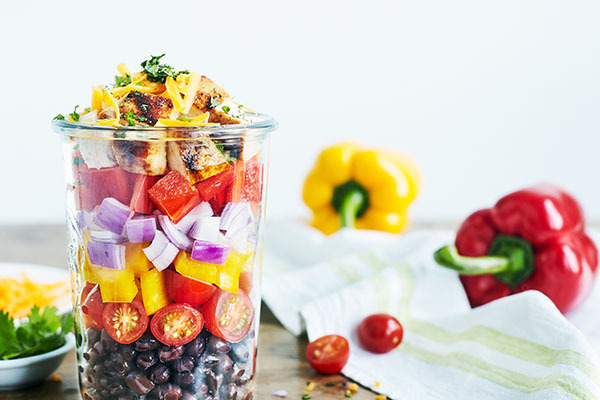 Easily packed in a mason jar, this vibrant Southwest Chicken and Black Bean Salad tastes as good as it looks. Using Mason jars is a handy trick for avoiding soggy salads at the office. It makes meal prep a breeze, and because the layers keep ingredients separate, these jars can keep fresh for days. Pro tip: When packing this black bean salad into your jars, the general rule of thumb is to put wettest ingredients at the bottom, followed by the heavier ingredients. 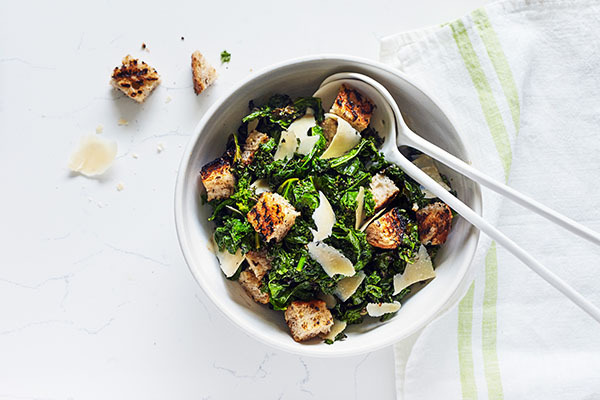 This Healthier Caesar Salad is the perfect side to pair with meal-prepped proteins like oven-baked salmon or tender grilled chicken breasts. This recipe uses grilled kale, but if you don’t want to spend the time grilling it, using raw kale works, too. Just make sure to “massage” the kale in dressing to reduce the toughness of the leafy green. Get the recipe. Quell those Taco Tuesday cravings with this healthy Taco Salad featuring our flavorful taco seasoning blend, lean ground turkey, and creamy avocados. We gave the classic taco salad a makeover and created a light, healthy taco salad recipe. 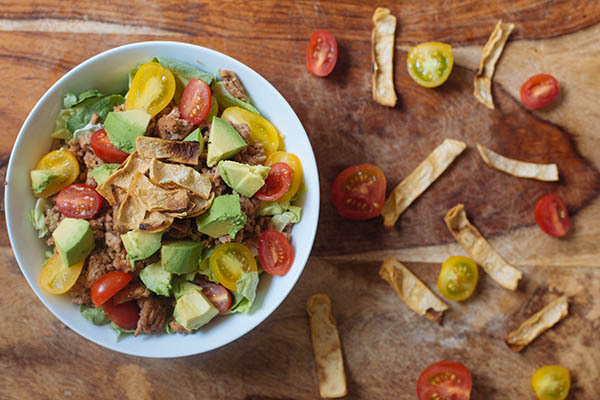 We swapped ground beef for seasoned ground turkey, loaded it up with lots of crisp lettuce, juicy tomatoes, avocado, and crunchy tortilla strips on top. Get the recipe. 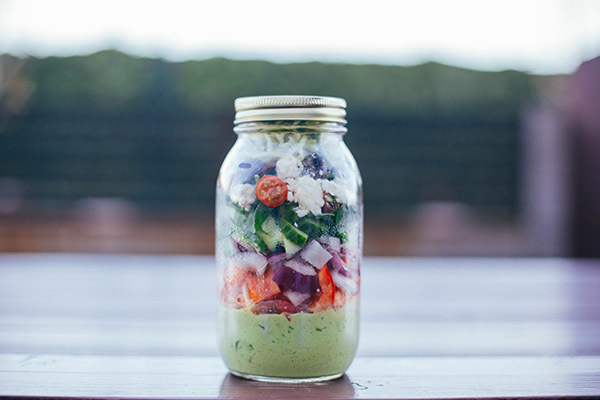 If you’re a fan of zoodles, this Greek Zucchini Salad in a Mason Jar is for you. It also travels well and shakes up in an instant. The creamy avocado and yogurt dressing with garlic and fresh herbs rests at the bottom of the jar, so nothing gets soggy. In fact, the celery and bell peppers marinate in the dressing, making them even more flavorful. Pro tip: If you don’t have a spiralizer, you can use a vegetable peeler. Cut each zucchini into lengthwise strips about ⅛-inch thick. 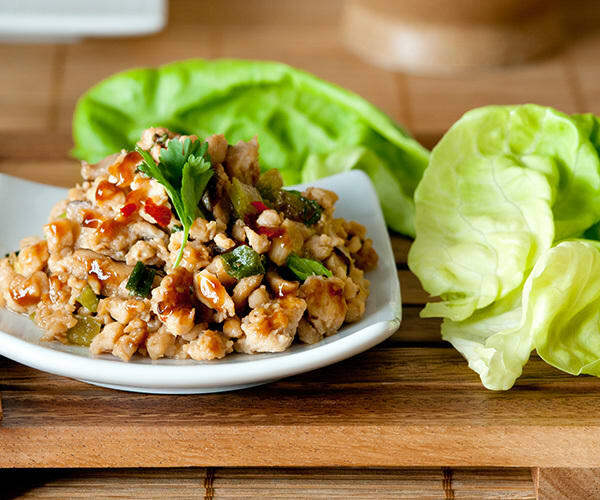 Prepare these super simple to make Turkey and Lettuce Wraps and enjoy the crazy delicious results all week long. Lean ground turkey with a host of fresh aromatics like zesty red onion and fragrant cilantro creates a flavorful filling. Bonus? They taste just as good cold or hot. Get the recipe. 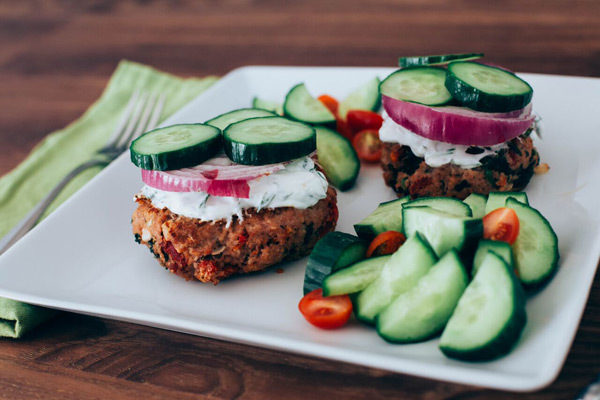 Bask in the goodness of this flavorful Mediterranean Turkey Burgers featuring a bright cucumber dill yogurt sauce and savory turkey burger patties. One of the secrets that make these turkey burger patties so good is the spinach that’s mixed in with the meat. Its dark-green leaves add color and it helps keep the meat moist and tender as it cooks. 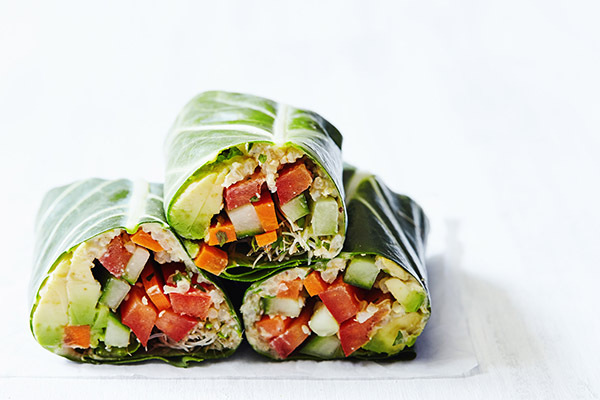 Add some crunch to your lunch with these Crunchy Veggie Wraps. This no-cook recipe is wrapped in hearty collard greens, so it’ll stay crisp and fresh until the weeks done. Collard greens are a gluten-free alternative to wheat-based tortillas. They’re also a great source of vitamin K, vitamin A, vitamin C, and fiber. Get the recipe. This isn’t just a hearty, Easy Turkey Chili; it’s versatile, too. You can make this according to the directions, to use the recipe as a template. Swap a cup of your favorite beans for the sweet potatoes. Not a spicy food fan? That’s okay, feel free to cut down (or omit) the chili powder. Craving a different meat? Sub in ground chicken breast or extra-lean ground beef instead of turkey. Get the recipe. 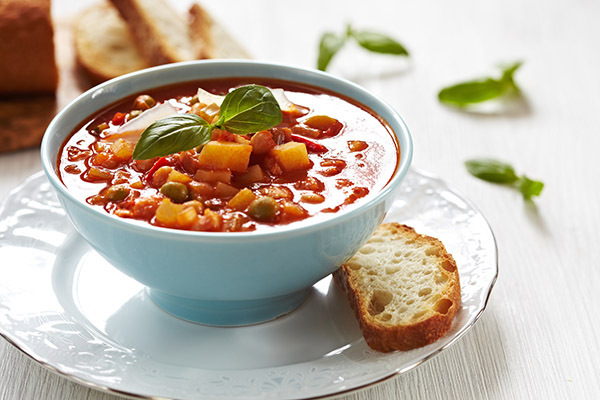 This Hearty Vegetable Soup features everything but the kitchen sink, made with onions, carrots, potatoes, zucchini, yellow squash, broccoli florets, and white corn kernels. 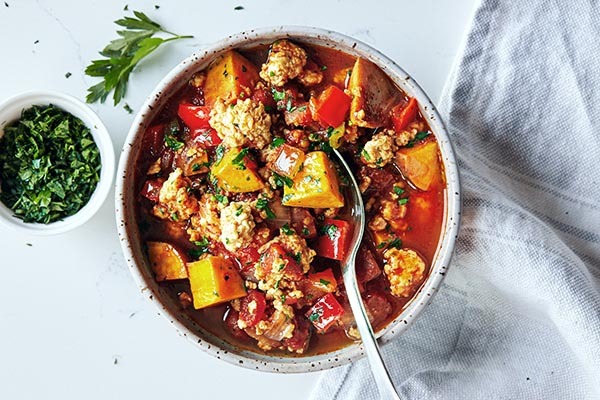 And like any great vegetable soup, this recipe allows for a little jazzy improvisation, so feel free to sub in your favorite veggies or whatever you’re in the mood for. Get the recipe. 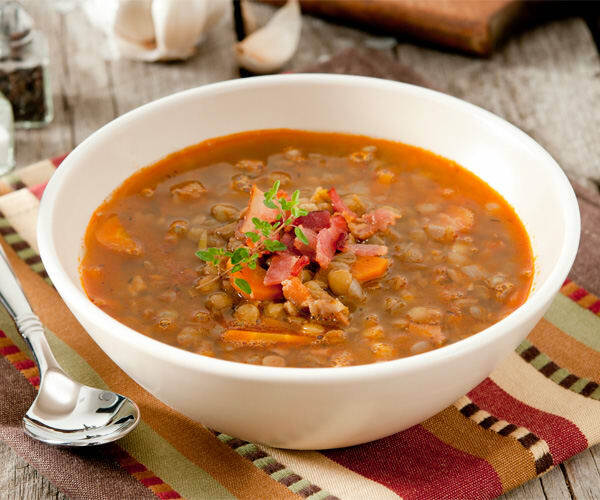 When the weather takes a turn for the worse, warm up with this satisfying Lentil Soup made with savory aromatics and fresh veggies. Get the recipe.